CD reviews: "Live at the Texas Opry House," "Hot Tamale Man," "Broke Down: Blues About Automobiles," "Texas Guitar Greats Vol. 2," "Back Against the Wall: The Texas Country Bluesmen," "We Love You Bobby  A Tribute to Bobby Bland" and "Blue-Eyed Soul of Texas"
These reviews first appeared in the Summer 1993 edition of Blues Revue Quarterly magazine (now Blues Revue). This set of albums is part of Collectables Records' reissue of the Home Cooking Record Company catalog on CD, with tracks from other labels and some new Home Cooking tracks also pulled in on the compilation releases. While the sound quality is good (especially given that these releases are taken from analog master tapes), the liner notes are incomplete, there are almost no songwriting credits, and musicians (especially sidemen) aren't listed. Considering that the compilations feature a heck of a lot of relatively unknown artists, the paucity of information is a serious oversight  where will get information on artists such as Loudmouth Johnson, Count Jackson, or Little Junior One Hand if not from these compilations featuring them? Another complaint is that several tracks are repeated within the series. Johnny Williams' "Honey Child" is found both on "Blue-Eyed Soul" and "We Love You Bobby,: as is "One of These Days" by Rockin' Dave Allen. 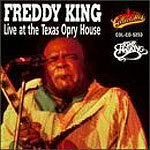 Of the bunch, the Freddy King live album is the most polished. Recorded only eight months before his untimely death in December, 1976, "Live at the Texas Opry House" is a tremendous recording featuring his seamless blending of both Texas and Chicago postwar electric blues styles with a dash of rock thrown in. With his trademark slashing guitar lines and smooth, soulful vocals, King put on a mesmerizing performance. The backing band, a local Houston outfit headed by Bugs Henderson, is solid, giving King all the room he needed to stretch out for searing improvisational solos. The unnamed piano player is very strong, pushing King to higher and higher levels of performance. Henderson also trades a few licks on guitar with King, and is as strong as the pianist. Given the few Freddy King albums available, this is a real gem. It's too bad they misspelled his first name as "Freddie" on the spine, though. But given the sterling clarity of the recording  far better than that on most "live" recordings, even on major labels  and the excellence of his performance, this album is still, despite the above complaints, very highly recommended. The T-99 Nelson album was the real sleeper of the batch. As versatile a performer as you'll find, Jimmy "T-99" Nelson's style ranges from the '50s-style Louis Jordan R&B to Count Basie's K-C charts. No surprise there, since Nelson (according to the liner notes) had several minor R&B hits in the late '40s. This album was recorded by Home Cooking Records in 1970, and shows Nelson in strong form. Backed by Arnett Cobb & The Mobb, Nelson's smooth vocals and sophisticated, jazzlike phrasing recall great jazz-blues singers such as Jimmy Witherspoon, Jimmy Rushing and Charles Brown. The horn charts are tight here, like those of Jeannie and Jimmy Cheatham's Sweet Baby Blues Band, and Nelson knows how to properly front a horn band, giving the sidemen plenty of room for solos. Cobb's band here features a guitarist, and he sounds to be playing a hollow-body electric, with the big, fat sound reminiscent of Joe Pass or Fenton Robinson. The compilation albums aren't nearly as good as the above two releases focusing on a single artist. No matter how you look at it, an album built around the theme of automobiles is a bit of a stretch  like something hawked on late-night TV by K-Tel Records. (2002 update: The same theory holds true for Rhino's Hot Rods & Custom Classics: Cruisin' Songs box set.) There's some interesting music on "Broke Down," but there's no musical theme, with songs ranging from garage band grunge to early Johnny Winter (circa 1968) and the R&B of Peppermint Harris. The problem with "Back Against the Wall," purportedly a collection of "Texas Country Bluesmen," is that too many of the cuts are by postwar urban artists playing in an acoustic setting. It takes more than shutting off the electricity to define country blues, and Johnny Winter is not a "country bluesman," as a quick listen to the bass lines and guitar leads on his 1967 recording of "Kind Hearted Woman" will confirm. It's urban, postwar Chicago blues played on an acoustic guitar  nothing more. The same goes for the two Brother & Sister cuts, and the Johnny Copeland cut. Now, there is some really good country blues here, with performances by Mance Lipscomb and Juke Boy Bonner and lesser-known artists such as Texas Alexander, Wright Holmes and Pops Overstreet. But it's not a country blues album; it's a hodgepodge compilation of different blues artists with a connection to Texas. "We Love You Bobby," ostensibly a tribute to singer Bobby "Blue" Bland, features covers of songs he recorded by various artists, the best-known of whom are by far T-Bone Walker and Fenton Robinson. But is Walker's "Further On Up the Road" truly a "tribute" to Bland, or merely Walker's own interpretation of the song? (Hint: It sounds nothing like Bland and everything like Walker.) "Honey Child," by Johnny Williams, features a most un-Blandlike bossa nova back beat, while "Two Steps From the Blues" is an instrumental! The only two tracks that are at all reminiscent of Bland are Buddy Ace's cover of "Who Can Tell" and Fenton Robinson's reading of "As The Years Go Passing By." It all combines to fuel suspicion that this is no tribute, but a cobbled-together collection taken from existing recordings to fill out the CD. "Blue Eyed Soul of Texas" features more than a dozen white soul and rock bands from the Houston area recording during the late '50s through the early '70s. Roy Head's "Slip Away" is a very polished bit of R&B, as is "Out of Left Field" by C.L. Weldon. The rest ranges from very good regional R&B to the kind of unfocused "blues" you can hear in any bar in Anytown, USA on any night of the week. There's nothing really memorable here outside the two aforementioned songs. "Texas Guitar Greats" is the best of this series of compilations. The two cuts from 1968 by Johnny Winter (just before he signed with Columbia Records) are pretty close to what he did on his first national release, 1969's "Johnny Winter": lots of great guitar licks accompanied by his hoarse vocals. More interesting than the well-known Winter is young newcomer Lowdown Brown, whose guitar picking on the contemporary electric blues "Mud Alley" is breathtaking. The 26-year-old Brown will likely be heard from again if this cut is at all typical of his playing. There are also some strong electric blues turned in by Big Al Bettis and Little Junior One Hand (who also play together as The Sheetrockers) and some old '50s sides by Royal Earl. All in all, it's a fine collection of some great guitar-based blues. Outside of "Texas Guitar Greats," the compilation albums in this series are pretty uneven. The prices of CDs being what they are, it's pretty hard to recommend them to any except the most hard-core blues collector who simply has to have everything.